Your skin requires an application of Vitamin A every day to function at its peak. If there were ever a product that was good for everyone - this is it! Ensure your skin ages slowly with a daily application of Retinol. Improve the growth of skin cells. Ensure proper maintenance and function of skin. What is the difference between Retinoids - Tretinoin - Retinoic acid - RetinA and Retinol? Retinoids are actually a class of chemical compounds related to Vitamin A. Retinoic acid (generic name Tretinoin, trademarked names RetinA, Avita, Renova) requires a prescription. It is the acid in its strongest form. Its percentages range from 0.025% - 0.10% because of how excessively irritating it is. It can cause redness and visible peeling that is quite uncomfortable for most skin types and can take several months and up to a year to acclimate to. Retinol is the solution if prescriptions are not for you, do to the fact that you have more sensitive skin, or because you would rather avoid the irritant entirely. Pure retinol works with your body since it is so close to its original form, and is directly converted INTO the retinoic acid your skin can use! Since it is converted into acid deep in your skin, you can avoid the unsightly redness and shedding that is so common when it is applied directly to your skin. You have to make sure to get the right retinol! Now, understandably if your body needs to convert retinol into retinoic acid you are going to lose some of its potency - this is to be expected. This is where the molecular structure becomes so valuable. Since our retinol is micronized, it penetrates very deeply into the skin and will retain a much higher value when it is converted. Compare that to a standard retinol that will not penetrate easily and the majority of its strength will be lost before it has the chance to convert into its active form. Retinol itself also comes in many variations (retinol, esters, palmitate, acetate). These other versions of vitamin A have molecules that are too large to penetrate the skin, or in the acetates case they are too small and crystallize too quickly. So, if the molecules are too deep to penetrate, what is your option? Most retinol creams and serums are virtually useless? The main reason is that they do not deliver a significant enough amount of retinol into the skin's cells. Secondly, they cannot get the retinol deep enough into the skin. We have solved this issue by formulating the retinol in a special delivery system. This system ensures stabilization of the molecule without oxidation, and enhances cutaneous absorption of Vitamin A through the epidermis. Our serum is obtained at 12,000 psi under micro fluidizing conditions. Our delivery system can get the Vitamin as deep as your PRICKLE layer! This is 4 layers deep! Once our retinol reaches your prickle layer and converts into retinoic acid, you will get a higher percentage than you would with a plain (non-microfluidized) retinol product. Don't be fooled by high percentages that will never convert at a high percentage in your skin. A standard retinol product will loose about 500X its stated percentage when it gets converted by the skin into retinoic acid. Not to mention it will degrade by several percent before it is even applied to your skin. You aren't getting the benefits you think you are following this logic. Now you can really see how special this product is. Which percentage should I choose? .10% - If you are just beginning your retinol usage or have sensitive skin always begin here. .20% - If you have acne, are ready to move up in strength, or have used prescription Renova in the past, start here. .30% - If you have been using RetinA and are switching to over the counter, choose here. .50% - If you are needing stronger, advance to Step 4 Luminosity .50% Retinol Cream. Retinol is necessary for the growth, maintenance and function of the skin. It also helps to prevent premature aging of the skin. Retinol is a derivative of Vitamin A. It is enzymatically converted in the human skin to Retinoic Acid. Retinoic acid has direct effect on skin cells, and can adjust their metabolism toward a more youthful state. Vitamin A also works extremely well on your acne! Retinol can help to shed the top surface of skin as well as deeper inside the follicles, reducing plugs. Vitamin A benefits the skin by stimulating the body's natural production of collagen, (one of the key building blocks of skin). This rebuilding action can make wrinkles look less severe and can reduce the appearance of splotchy-ness, age spots, and sun damage. Retinol also benefits acne skin and super speeds the healing of acne lesions. Other popular Vitamin A treatments are RetinA tm (prescription retinoic acid aka tretinoin) which is mainly for Acne, and Renova tm which is for Aging skin. Antiaging: This Vitamin A serum is excellent for all skin types looking to preserve youthful looking skin and prevent deep lines. It is especially valuable for weathered skin types showing excessive signs of aging. It will help to smooth and freshen the skin's appearance very quickly. Acne: Platinum Skin Care CEO Jennifer, finds Retinol .20% is absolutely mandatory in keeping her acne prone skin looking clear and healthy! "I find that if I do get a pimple, the redness is gone in as little as one week, opposed to several weeks and even months! It puts my skin into a hyper-regenerative mode. As soon as the blemish is healed the mark is practically gone. It is my 'can't live without' product... well, this and my Vitamin B Complex and AB Cleanser". Large pores: Due to its ability to aid in shedding the follicle walls, the skin can long-term, temporarily tighten and minimize the look of pores. Psoriasis: Topical retinoids (retinol) are helpful tool in managing psoriasis. 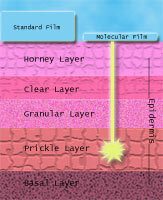 This is because of its ability to control the way that new skin cells are formed. Retinol communicates with the cells that are overproducing and "tells" them to behave in a healthier manner. Apply retinol one time per day onto clean skin. Watch for dryness or irritation and cut back, or add other hydration to combat. Apply to clean skin every other night before bed. *You can increase up to each day as long as you are not irritated. You will notice a glossy film immediately after application, however the film will dissipate within minutes as product absorbs, and skin will have a soft, silky feel. I have been using .30 Retinol Molecular Serum for the past few years. This is a product I cannot go without! I am in my mid 30's and I feel like my skin looks better than others my same age! *Results vary depending on individual needs and product usage. Please see us for personal recommendations. This is my fourth week using the retinol molecular serum .30 and I love it. I've noticed a difference in the softening of my lines and even the deeper forehead wrinkles. They are becoming less noticable. In fact, the other day while playing cards with a group of people, a friend said out of the blue "you have no wrinkles on your forehead, how is that possible?" (I'm 55) So, I told her about the retinol serum from Platinum Skin Care I had been using and directed her to your site. Thanks Platinum. *Results vary depending on individual needs and product usage. Please see us for personal recommendations. This product is now a staple in my evening regimen. I used to break out very badly in my chin area. No matter what product I tried I would get acne that actually would leave dark marks on my skin. I was always afraid to try new products and afraid to even wear makeup because of my skins sensitivity. I want to say it took 3-4 mos for this product to clear up my skin (I almost gave up) but I am so glad I didn't because now it keeps my skin clear, I can actually wear makeup, plus it keeps my skin looking fresh! *Results vary depending on individual needs and product usage. Please see us for personal recommendations. This is an updated review that I made a while back. At the end of this month, it will be the 3 month mark of using this product. My breakouts have stopped. My skin is balanced... not too oily and not too dry. But the reason I had to make the updated review now is because my husband just randomly told me how clean and clear my skin looked while we were talking. This is the first POSITIVE comment he has made on my skin. And I must admit, my skin is looking a lot better than it has for a long while. I have less breakouts, my old acne marks are almost gone, and my skin looks more hydrated. I didn't run out yet, but I just bought a second bottle with coupons. I also use the 10% glycolic toner about once per day. This toner most likely added to the benefit of the retinol. Like I said in my previous review, if this retinol were sold in higher percentage, it would be perfect! *See Luminosity. *Results vary depending on individual needs and product usage. Please see us for personal recommendations. I previously wrote a review complaining of bad breakouts from using this product. Following Platinum's advice, I cut back my application frequency to a few times a week and can now say I LOVE this product. I rarely use it all over my face, preferring to use it more as a spot/blemish treatment as it works great at clearing up breakouts. I'm a little scared to put it all over my face only because I think I'd be over-exfoliating my face which I believe was what was causing the initial breakouts (I was previously using the glycolic serum in the mornings and retinol at night, which I think was just too much exfoliation). However, using glycolic as an all over face treatment and retinol as a spot/localized treatment has been great. *Results vary depending on individual needs and product usage. Please see us for personal recommendations. I originally bought the sample size of of the 10% serum and didn't see a whole lot of difference. Next I purchased a full size of the 30% which is fantastic. Unless you have really sensitive skin that takes a long time to acclimate, I would suggest doing the same. The full size lasts a LONG time and the results with the 30% are much better. ***Platinum comment*** Many people find that the .30% will cause their skin to be very sensitive (especially if you are using otherstrong products at the same time). It is true that the .10% does not cause irritation. Please be cautious though and start off with a sample size of the .30% to be sure you are not going to be bothered. *Results vary depending on individual needs and product usage. Please see us for personal recommendations.